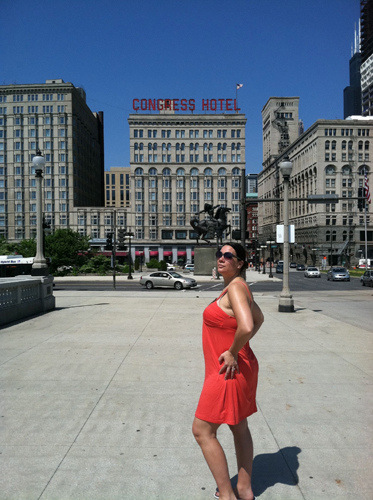 In this Found Performance I was ‘performing’ a pregnant woman tourist, adopting cheesecake poses in front of key sites in Chicago. I am just starting to see and feel the changes in my body, like a young girl going through puberty. Standing with other American tourists in front of the Congress Hotel and Buckingham Fountain, I am enjoying how being pregnant creates a kind of down-home innocence in me, like American pie or the girl-next-door.